This rare "Le Mans" roadster is a standard Austin-Healey 100M on steroids. Nearly a decade before the Fab Four took the United States by storm in 1964, another quartet from across the pond began making their mark in post-WWII America. Instead of John, Paul, George, and Ringo, the names of the members of this foursome were Jaguar, MG, Triumph, and Austin-Healey. Boosted by an improved economy and a strong dollar, Americans began buying British sports cars in the mid-1950s as if they were going out of style … and, of course, some of them were. Specifically, the Austin-Healey 100M and its “Le Mans”-upgraded best mate. The model that put Austin-Healey on the map as a marque, Donald Healey built the original “Hundred” roadster using Austin mechanical components and showed it at the Earl’s Court Motor Show in 1952. Featuring sleek lines, ample power, and work by designers Gerry Coker and Barry Bilbie, the roadster drew the attention of Austin managing director Leonard Lord and he commissioned the model to be rebranded as the Austin-Healey 100 and produced in bulk. Named for its ability to hit 100 miles per hour, the Austin-Healey 100 was a production sports car with aspirations of being something more. To help with that and capitalize on the notoriety the car’s ‘52 debut had generated, Austin-Healey entered two slightly modified 100s at Le Mans in 1953. The cars weren’t able to even sniff the winner’s circle at the grueling 24-hour race, but they were able to finish it in 12th and 14th places, a fairly respectable result all things considered. 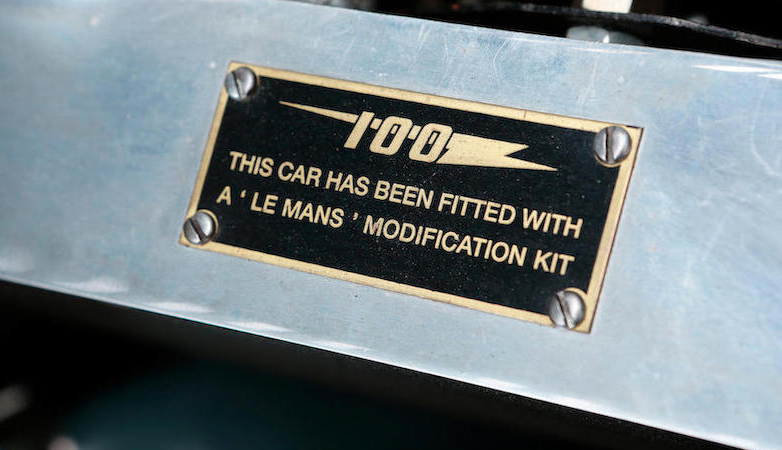 To commemorate that achievement and further promote the model, Austin-Healey began selling aftermarket “Le Mans” upgrade kits that included a pair of SU carburetors, a cold-air box, a beefier valve springs, and boosts to the ignition system, among other things. To complement sales of the bolt-on performance kits, Austin-Healey also began selling factory-built versions of the Le Mans 100M and produced just 640 examples between September 5, 1955 and July 16, 1956. Of those, only about 250 are still thought to be in existence, of which the blue-and-white model you see here is one. Now capable of hitting 120 MPH thanks to its four-cylinder engine, four-speed manual transmission, and upgraded twin carburetors, this ’56 Austin-Healey 100M Le Mans roadster spent most of its time in Florida before being shipped to Switzerland in 2010. It was eventually acquired by its current owner and given a “ground upwards” restoration to its original specs in Belgium. Gold-level certified by the 100M registry of Bill Meade (the highest recognition of the car’s originality) chassis No. BN2-L/230581 comes with one of the very few hand-built wooden steering wheels by the aforementioned Don Healey. Crossing the block courtesy of Bonhams at the Zoute Sale at Place Albert de Knokke Le Zoute in Belgium on October 5, the car is expected to fetch somewhere between $180,000 to $210,000. For more information about the Zoute Sale or the rare roadster, head over to Bonhams.